The U.S. hip-hop movement of the 1970’s created a booming sub-culture that has since crossed cultural borders worldwide and established thriving hip-hop cultures in countries and cultures as far flung as Romani hip-hop in the Czech Republic (Gipsy.cz), Uyghur hip-hop in Xinjiang, China (Six City), Basque Country hip-hop in Spain (Negu Gorriak) and a particularly strong and diverse scene in Japan (King Giddra, M-Flo, etc.). As John M. Chu says “Dance has never had a better friend than technology,” and thanks to technology dance has spread far and wide, constantly evolving and breaching cultural boundaries. Of particular interest to me is the exchange that led to hip-hop’s establishment in Japan, but in order to understand that we first need to look what hip-hop is. Hip-hop culture developed out of the harsh living conditions of the Bronx of NYC during the 1970’s. Heavily influenced by the gang mentality, many sought to use hip-hop as an alternative to the violence that was rampant in NYC at the time. A dancer freezes on one hand in an acrobatic display of dance ability. Photo taken by Brad Breiten in Osaka, Japan (April, 2011). Hip-hop worldwide is made up of four main elements: the music (usually incorporating samples of music from other genres in a blending of what are called “breakbeats”), rap (the lyrical aspect of hip-hop music), breakdance, and graffiti. Hip-hop music, rap and breakdance developed in tandem with each other in the 1970’s and early 1980’s, while graffiti developed individually in the late 1960’s. It was eventually incorporated into hip-hop culture due to its association with gangs and because the underground and often counter-current content and philosophy associated with it meshed well with the ideas of hip-hop artists and practitioners. When hip-hop made its way across the pacific to Japan in the 1980’s, the four elements of hip-hop culture were already developed artistic styles in their own rights. Because of this, hip-hop forerunners in Japan adopted the elements of hip-hop in order of ease of cultural permeability. Dance is a universal human capability and can be easily understood and internalized without the necessary grammatical understanding needed to transverse linguistic boundaries. 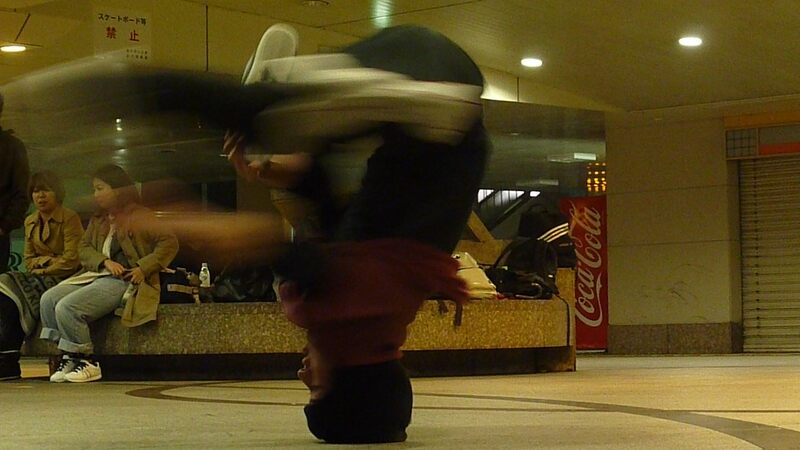 First generation Japanese hip-hop participants quickly adopted breakdance. Being the visual performance style of the body it was easy to adapt and interpret. Hip-hop music was imported from the U.S. at first, but as music collections and availability grew in Japan, Japanese musicians began to try their own hand at production. Because breakbeat music is done primarily through sampling other pieces of music and musical styles, as the availability of hip-hop music increased in Japan, people were able to practice, sample and produce better tracks. During this time of artistic development of hip-hop dance and music styles Japanese musicians and singers were attempting to incorporate the voice as a musical element in Japanese hip-hop; however, they found that the Japanese language was ill adept for the proper cadence and rhyming patterns that American hip-hop used. Japanese is a mono-tonal language and because of the grammatical structure of sentences and verbal conjugations, rhyme was not a usual feature in earlier Japanese music or poetry. For nearly a decade after hip-hop’s introduction to the Japanese archipelago rap was considered an insurmountable hurdle and the years from 1992-1994 produced so little in the way of rap that it is considered to be the ice age of rap for Japanese artists. However, in 1994 the Japanese music group Sha Dara Parr was able to produce a crossover music hit called Kon’ya wa būgī bakku (シャダラパー 「今夜はブーギーバック」1994). This feat ushered in a new era of hip-hop culture in Japan where, having finally shown that hip-hop could produce hit records, artists began to produce rap and hip-hop music prolifically. 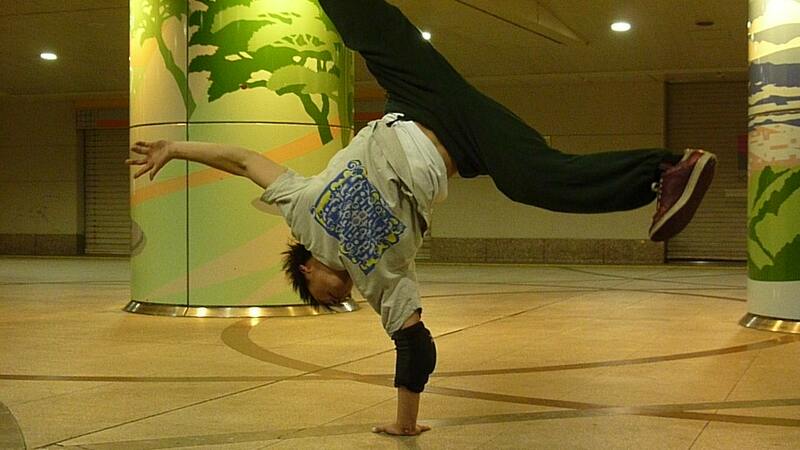 A dancer practicing headspins. Photo taken by Brad Breiten in Osaka, Japan (April, 2011). Hip-hop’s introduction to Japan came from a cultural dialog that crossed the pacific through film. Hip-hop artists from the Bronx that lead the way in developing different breakdance styles and moves claim in interviews to have been greatly influenced by foreign martial arts films that came from Japan and China, particularly films including the martial arts of Bruce Lee. Drawing inspiration from the athletic kicks, flips and spins, NYC breakdancers developed their style to be athletic, energetic, and exciting. In the late 1970’s and early 1980’s a number of hip-hop crews (an evolution from the gang culture of the late 1960’s) created films to cement the standards of hip-hop culture and to spread their names and styles outside of their immediate proximity. Their attempt to increase their reputation spread hip-hop culture globally and in 1983 the film Wild Style was shown in Tokyo theaters. 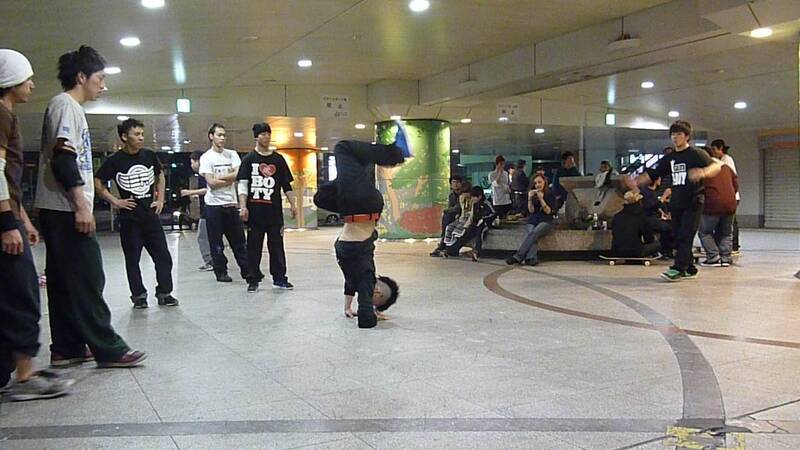 Japanese hip-hop forerunners remember seeing breakdance scenes like those in Wild Style and Flashdance; unable to comprehend the lyrics of the music and ignorant at the time of the cultural contexts of hip-hop in the U.S., Japanese hip-hop forerunners claim to have been mesmerized by the dancing. Some even state that when they left the theater, all they could remember were the breakdance scenes. The global current of hip-hop culture still exists. Modern day youtubers, breakdance blogs and forums, and movies depicting hip-hop culture follow the same pattern as the crews of the 70’s and 80’s in dispersing hip-hop culture globally. A movie or a track is made, it is published, and then distributed. However, with the advent of new technologies, dance culture now moves globally faster and more easily than ever before. Could it be that the evolution of technology and the advent of the internet has produced a kind of third space for the transmission of dance. Jon Chu, in his Ted Talk, gives an example of modern dance transmission and evolution: “Online videos and social networking … dancers have created a whole global laboratory online for dance, where kids in Japan are taking moves from a YouTube video created in Detroit, building on it within days and releasing a new video, while teenagers in California are taking the Japanese video and remixing it with a Philly flair to create a whole new dance style in itself. And this is happening every day.” It is the same formula of exchange through film except that modern day transmission moves at warp speeds. It is important to not forget how technology connects us and enables cultural transference in newer, more efficient ways. A large community breakdance gathering, known as a cypher, where people gather to exchange and show off their skill and ability. Photo taken by Brad Breiten in Osaka, Japan (April, 2011). Condry, Ian. Hip-hop Japan: rap and the paths of cultural globalization. Durham: Duke University Press, 2006. Mitchell, Tony. Global noise: rap and hip-hop outside the USA. Middletown, CT: Wesleyan University Press, 2001.